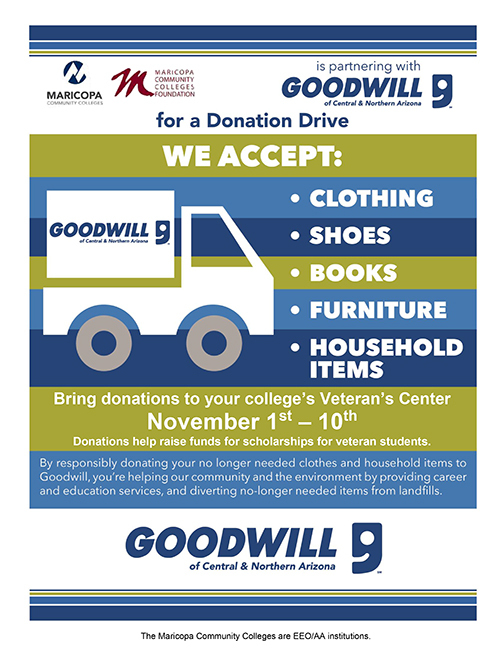 Join us in an effort to raise funds for veteran scholarships and emergency cash reserves by donating clothes, shoes, books, household items and small furniture, Nov. 1 – 10 to Goodwill of Central and Northern Arizona! 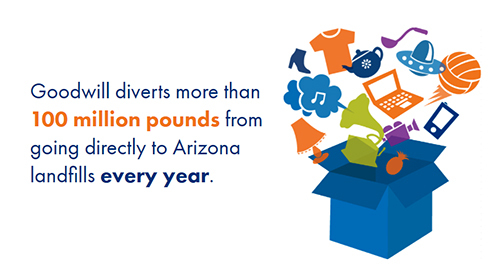 You can drop off your donations at Rio Salado's Tempe headquarters, the East Valley Veterans Education Center or any of the Maricopa Community Colleges. The proceeds from this effort will go to a special Maricopa Community Colleges District Foundation fund for veterans, which will be equally distributed among the 10 Maricopa Community Colleges. This funding will provide veteran students access to courses the VA may not pay for or assist them financially during hardships – all in an effort to help them graduate. Items being accepted: books, clothing, computers, cooking supplies, electronics, furniture, housewares, handbags, jewelry, knick-knacks, linens, instruments, pictures, shoes, sports equipment, tools, and toys. Items that will not be accepted: auto parts, building materials, hazardous materials, tires, cleaning products, flammable products, pesticides/lawn garden products, paint/paint supplies, televisions. Rio Salado is proud to join Goodwill of Central and Northern Arizona, the Maricopa Community Colleges Student Affairs Office and the Maricopa Community Colleges District Foundation in this effort to help Valley veterans! Have questions? Rio Salado students and staff should contact Tara Simo at 480-517-8675 or tara.simo@riosalado.edu.